Normally a GDP growth rate of 7% would be a cause for celebration. But Indian Prime Minister Narendra Modi wants more and China is struggling to prove its growth numbers are sustainable and for that matter reliable. Ambitious reform programmes in China, as well as India and Indonesia, offer hope for the future. Central banks remain pro-active too, as evidenced by interest rate cuts in China, India, Taiwan and South Korea. The rapid rise, fall and rise of the Shanghai and Shenzhen stock markets leaves domestic and overseas investors taking stock, and in many ways China holds the key to sentiment across the region for 2016 and beyond. A three-year crackdown on corruption by President Xi Jinping continues to dominate the Chinese political scene. Accusations of graft threaten to lay low another leading political light in Asia. Malaysian Prime Minister Najib Razak is under pressure to quit as he fights allegations that $700 million was paid by the 1Malaysia Development Berhad (1MDB) state investment fund into one of his personal bank accounts. One political bright spot in the region will hopefully come in the form of Myanmar, where Aung San Suu Kyi and the opposition National League for Democracy won November’s landmark elections. Presidential and Parliamentary elections are scheduled for 2016 in Taiwan and the Philippines, while South Korea will also hold a general election. Thailand could in theory see a poll too, although this seems less likely as the one-year old military junta wrestles with an economic slowdown and concerns over national security. Everyone may have entered 2015 looking for interest rate rises, but Asia has offered nothing but interest rate cuts. China, Taiwan, India, Thailand and South Korea all cut the headline cost of borrowing in response to growth worries and, in Korea’s case, an outbreak of Middle East Respiratory Syndrome (MERS). To add fuel to the fire, China also adjusted how it set the value of its currency, the renminbi, against the dollar. Further reforms are likely, especially as China prepares for the 2016 inclusion of its renminbi currency in the basket of currencies which underpins the IMF’s Special Drawing Rights (SDRs). Another key plank of China’s growth policy is the new Silk Road, designed to link over 60 nations and four billion people. 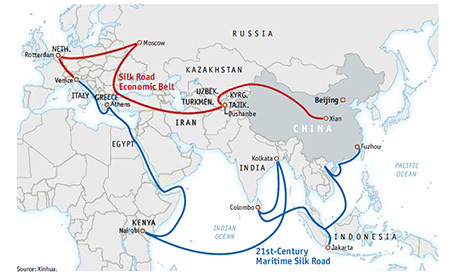 Throw in the BRICS-backed New Development Bank, Asian Infrastructure Investment Bank and the Hong Kong-Shanghai Connect mechanism and Beijing is pulling out all the stops to attract cash and create a place for it to go in search of a return along the Silk Road, all at the same time. Click on the map to view larger version. China is not on its own when it comes to seeking reforms that boost growth. Narendra Modi and Joko Widodo, the Prime Ministers of India and Indonesia respectively, are both seeking to give their economies fresh impetus but progress is proving slow and hard-earned. As it is in Japan, the UK, Western Europe and America, debt is the elephant in the room and its influence can be felt upon financial markets in the Asian region. A report from consultants McKinsey entitled Debt and Not Much Deleveraging shows borrowings have in China rocketed from $7.4 trillion to $28 trillion, or from 158% to 282% of GDP between 2000 and 2014. Source: McKinsey Global Institute, Debt and Not Much Deleveraging, February 2015. At least Asia still nowhere near as heavily indebted as the West, with a debt/GDP ratio of 156%, compared to 377% for Developed Markets overall. 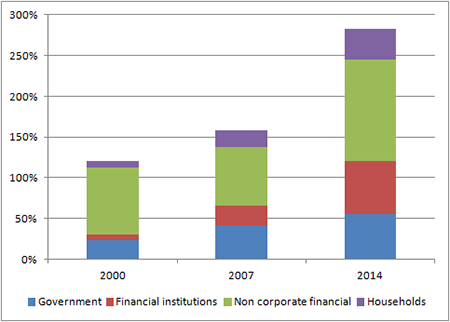 However Asian corporations have been heavy borrowers, especially in dollars. This year’s gains in the greenback’s relative to counters such as the Thai baht, Filipino peso and Indonesian rupiah have added to these firms’ liabilities in local currency terms, ratcheting up the pressure on their balance sheets by a notch or two. 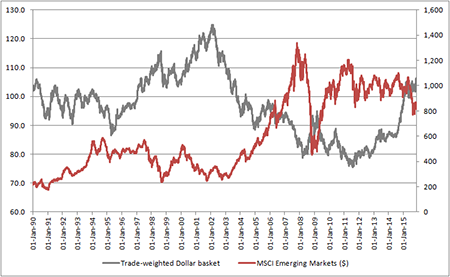 History shows a strong US currency is traditionally a bad sign for Emerging Market stocks overall, as this chart below suggests. However the past is no guarantee for the future and the good news for Asia is that there is so much bad news about it may already be at least partly in the price. 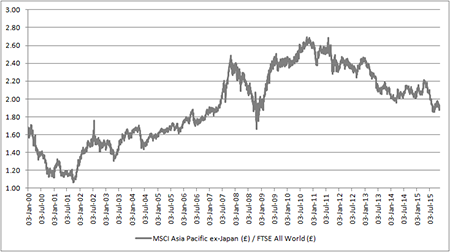 The chart below shows the MSCI Asia Pacific ex-Japan index (in sterling terms) divided by the FTSE All-World (also in pounds). 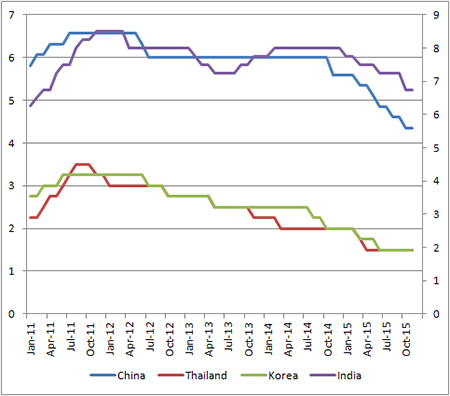 If the line rises, Asia is outperforming and if it falls the region in underperforming. Like other Emerging Market (EM) areas – Latin America, Eastern Europe, Africa and the Middle East – Asia ex-Japan has underperformed consistently since 2011, even if EM woes have really only begun to make the headlines this year. This four-year stretch could suggest there is some value emerging, although keen students of history will remember that EM equities lagged global equities from 1994 to 2002 as a debt crisis brewed, broke and then weighed on growth for some time. As such there are no guarantees a four-year losing run signifies the bottom. China’s summer meltdown will not have helped here but the Shanghai and Shenzhen markets were still up for the year as 2015 drew to a close. 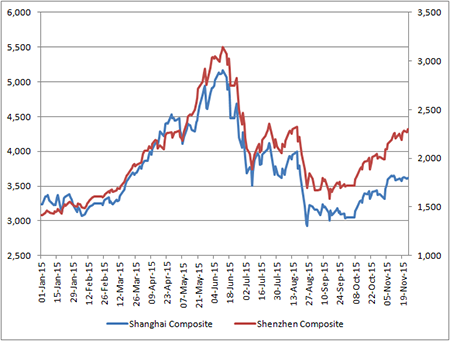 Shanghai has advanced by more than 10% in 2015 and the tech and small-cap-heavy Shenzhen benchmark by around 60%. Worries over whether China GDP really is growing at 7% a year are still a burden, however, and it seems mathematically unlikely that the world’s second largest economy can grow at that rate forever. Even so, it seems inconceivable that China will not bounce back at some stage, given the potential that could be unlocked by the Silk Road, reforms of State-Owned Enterprises and its financial markets as well as President Xi and Premier Li’s plan to rebalance the economy away from capital investment and construction toward consumption. However, the transition could be a tricky one to manage, especially given the debts that have built up in the system and Beijing is likely to provide further surprises, good and bad, in 2016 and beyond. AJ Bell’s free investment guidance service is based on our list of sixteen Top Trackers. One of these covers Asia, although not in a direct way. 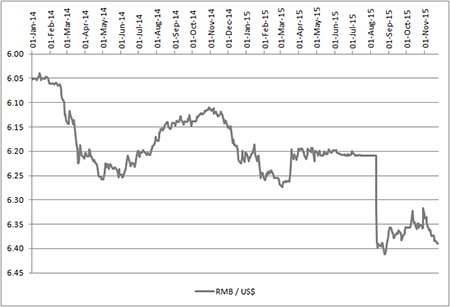 The UBS Emerging Markets tracker has the EPIC code of UB32 and a SEDOL of B76HL88. It comes with 69% weighting toward Asia. The tracker also provides exposure to Eastern Europe, Africa and the Middle East. This tracker does not feature in the Cautious portfolio but represents 7% of the Balanced and 15% of the Adventurous portfolios. These articles are for information purposes only and are not a personal recommendation or advice. All data shown is correct at the time of writing.